Automatic check if error is kept within the limits required by IEC61557-5. If after a measurement of probe-, auxiliary earth electrode- and earthing resistance, a measurement error of higher than 30 % is assumed because of the influencing conditions, the display shows a warning symbol and a notice that RS or RH are too high. Measuring method Current and voltage measurement with probe as per EN61557-5 and current measurement in the individual branch with additional current transformer (patent applied for). Measuring time Typ. 8 sec. with a fixed frequency 30 sec. max. with AFC and complete cycle of all measuring frequencies. * With recommended current clamps/transformers. Formation of measured value With 4-pole measurement wires on H, S, ES can be extended without additional error. Resistances > 1 Ω in wire E can cause additional error of 5m Ω/Ω. * Value of setpoint entry RK = 0.000 Ω, variable from 0.000 to 29.99 Ω by means of measuring adjustment. Measuring principle: Stakeless measurement of resistance in closed loops using two current transformers. The information regarding stakeless ground loop measurements is only valid when used in conjunction with the recommended current clamps at the minimum distance specified. 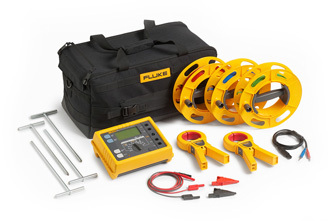 Click the button below to add the Fluke 1625-2 GEO Earth Ground Tester Kit to your wish list.